2018 Harley-Davidson Dyna Low Rider S Dark Custom. Picture credits - Harley-Davidson. Submit more pictures. Factory custom is about pushing the limits. And the Low Rider� S pushes them to a new edge. From the fixed speed screen in the front to the chopped fender in the rear, it�s raw custom style turned into dark metal. The star of the show is a blacked-out Screamin� Eagle� Air-Cooled Twin Cam 110� engine. Give it a good look. You�ll get the picture. Price as new (MSRP): US$ 16049. Euro 19995. Prices depend on country, taxes, accessories, etc. Front brakes: Single disc. ABS, 4-piston fixed. Ask questions Join the 18 Harley-Davidson Dyna Low Rider S Dark Custom discussion group or the general Harley-Davidson discussion group. Get a list of related motorbikes before you buy this Harley-Davidson. Inspect technical data. Look at photos. Read the riders' comments at the bike's discussion group. And check out the bike's reliability, repair costs, etc. 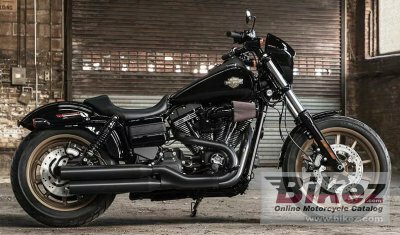 Show any 2018 Harley-Davidson Dyna Low Rider S Dark Custom for sale on our Bikez.biz Motorcycle Classifieds. You can also sign up for e-mail notification when such bikes are advertised in the future. And advertise your old MC for sale. Our efficient ads are free. You are also welcome to read and submit motorcycle reviews.